AARP’s Ideas@50+ event in San Diego featured AARP TEK’s new RealPad roll-out, the introduction of Joanne Jenkins as AARP’s new CEO and stars ranging from Kevin Spacey to Julia Louis Dreyfus to Martha Stewart. Move.com – the parent of realtor.com and seniorhousingnet.com hosted AARP members in a special “back porch” environment complete with lemonade and fresh baked cookies. Members heard from experts in senior care, caregiving, and aging in place technology. 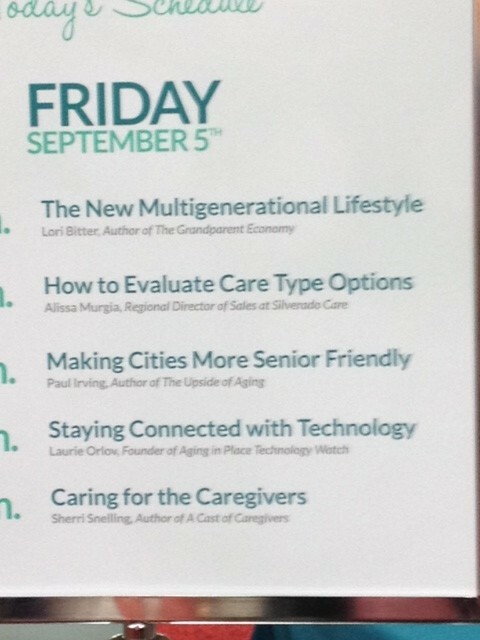 Paul Irving, Milken Institute, and author of The Upside of Aging, spoke on “Making Cities More Senior Friendly.” Lori did a presentation on “The New Multigenerational Lifestyle,” based on her new book The Grandparent Economy.